Quick and Easy Eggs Benedict | suppertime! A few weeks ago I had a longing for Eggs Benedict. I tried to make them the proper way, making my own Hollandaise sauce. It was a lot of bother and it didn’t work. I had wanted to recreate the delicious moment I first tasted this most divine of breakfasts, with Claire Bolderson in The Heathman Hotel in Portland, Oregon. I just ended up with a gloopy, curdled mess. Anyway, I had the yearning again today and, thanks to the combined wisdom of half a dozen different web pages, made my own version of what I now call Mollandaise Sauce – mock Hollandaise. 2 English Muffins – only here we just call them muffins. Lightly toast the muffins and grill the bacon if you are a carnivore. 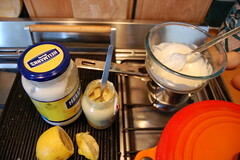 Make a bain marie – put a bowl over a pan of boiling water and put several dollops of mayonnaise in the bowl. Stir as it heats up and slowly add a teaspoon or two of Dijon mustard, a few teaspoons of water and the same amount of lemon juice. Poach 2 eggs in hot water with a splash of white wine vinegar. 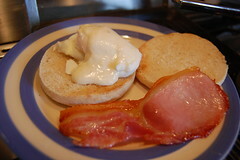 When cooked, remove the eggs with a slotted spoon, pat dry and place on a muffin. Spoon over the Mollandaise sauce. Add bacon. Enjoy! This entry was posted in breakfast, eggs and tagged breakfast, eggs, eggs benedict, hollandaise, mock hollandaise. Bookmark the permalink.